The other day when I stayed home because i felt crummy, I took only one picture. This is the window in our bedroom with the sunshine filtered through. It is unedited except for the framing. If you're a hammer, everything looks like a nail, and if the theme is "lines" everything you see is just that. Nice shot. Looks good, a nice simple, to the point shot. Good shot. Barrier of the sun. I love the light in this, and it makes a great theme shot! Even feeling sick you caught a photo full of LINES for the theme -- vertical lines and horizontal lines and of course intersecting lines. I like the light behind the shutters. awesome shot. hope you are better. 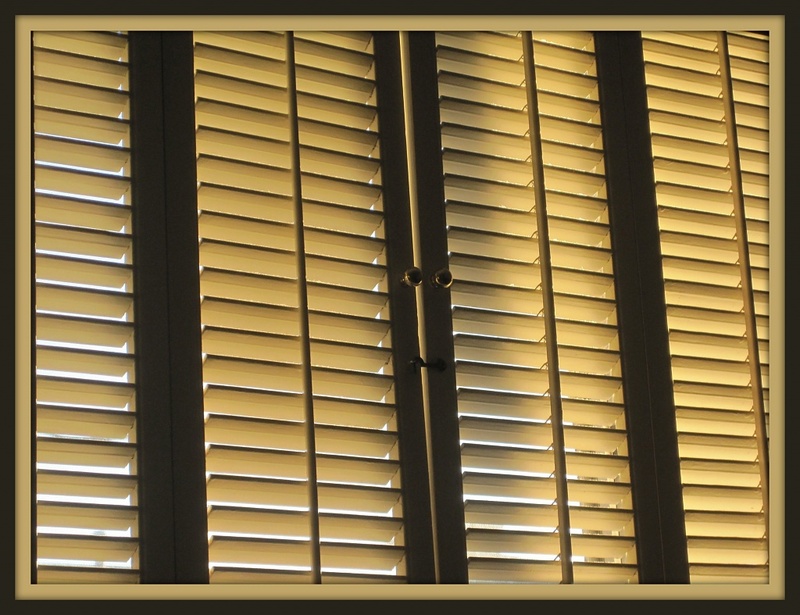 i'm thinking of getting plantation shutters ... are you happy with yours? thoughts or recommendations? Allison, hope you are feeling better! I love this shot! Simple, clean, I like the angle, and the color as well! I love what you have to say about seeing lines everywhere! I took pictures today through the shutters, too...haven't uploaded yet to see what today's "bounty" holds! Your choice with the filtered light is lovely, and I love the way they make a room look. Good shot. It makes it look like nap time. I'be photographed my shutters in the past too. By the end of our 365 yr there won't be much we haven't taken around home :-) Glad bug didn't keep you down for long. very strong lines. Nice soft, warm light. @hwy61 I was just thinking about that! I would like to keep going after the 365, but I hope I can still see new pictures to take and not just the same ones for another year. Allison, the only editing for the shopping carts was cropping, a faded poster effect and a frame...the smaller sized carts are blue at Food Lion ;-) Hopefully, I can find something a little more interesting today!!!!!!!!!!!!! love the lines! It has been prepay dry here too. We had some rain and snow (up high) the other day and it was great. It really is a beautiful Fall (my favorite season of the year). Good shot. Looks familiar to me. Hope you feel better by now. Wonderfully composed! Nice theme pic, I see these everyday and now will think of the lines! wonderful idea for the theme!